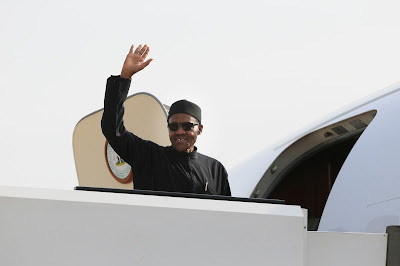 President Muhammadu Buhari will be visiting Washington D.C, the US capital for his meeting with President Barack Obama next week, Monday with an announced 32-man delegation and unannounced aides numbering an average of 10 that would be accompanying governors, ex-governors, State House officials and businessmen. This will bring the total number of Nigerians on this visit with President Buhari to about 229, being the biggest Presidential delegation in Nigerian democratic history. This contingent will cost Nigeria about N2.2billion from the virtually empty Treasury. The Presidency have earlier announced that those expected to join the President on the visit include Governors Kashim Shettima (Borno), Rochas Okorocha (Imo), Adams Oshiomhole (Edo), Tanko Al-Makura (Nasarawa) and Abiola Ajimobi (Oyo) Each with 15 aids. The rather large delegation will also have former Rivers State Governor Chibuike Amaechi; Buhari’s running mate in the 2011 presidential election, Pastor Tunde Bakare; former President of the Newspapers Proprietors’ Association of Nigeria (NPAN) and publisher of The Democrat, Ismaila Isa Funtua; a former Chief of Army Staff, Lt-Gen. Abdulrahman Dambazzau; and Halilu Sheni, a businessman. Others in the delegation will include officials in the presidency and some heads of government parastatals. Apart from the number about about 10 government officials have already left for the United States in what they claimed is preparing grounds for the Visit.